Welcome to what's probably going to be the most read page in this review. Without further ado, we introduce you the 6.4" edge-less screen of the Xiaomi Mi Mix. Take notice of the wording edge-less, which isn't necessary a synonym of bezel-less. First things first though. The 6.4" IPS screen is custom-made by Sharp and offers 1080 x 2040 px resolution or 362ppi density. That's the unusual 17:9 aspect ratio, but the extra pixels are mostly used by the navigation bar. We didn't have any layout issues with any of the popular apps we tried. They fill up the entire screen perfectly. While the 362ppi doesn't sound flagship worthy, you can't really see the individual pixels with your bare eye. The choice of IPS RGB panel instead of PenTile AMOLED surely helps for better utilization of the 1080p resolution over the screen real estate. Unfortunately, Xiaomi yet once again didn't mention any specific glass protection for the screen. Our review unit acquired a few scratches on top of its display in the first three days even though we were extra careful in handling it. Normally, we'd suggest opting for a screen protector, but this might take away some of that edgeless screen. Just treat it carefully and hope for the best. There is a good chance Xiaomi to have used two different suppliers for the screen glass, as there are YouTube videos showing the piece resist a great deal of scratches even when force is applied. Our case wasn't the same, and we found other people to have similar issues, but we can't deny the great results some YouTubers are getting with their Mi Mix when put to a scratch test. Turning on the display provides a guaranteed wow effect - especially if you see it for the first time. While the promo images surely have prepped us what to expect, we were still quite impressed. The edge-to-edge screen is certainly an attention-grabber, especially around the top part. The edge-to-edge screen didn't turn out bezel-less, as there is still a thin 2mm bezel around the big thing, and Xiaomi was very careful with its wording. Technically, calling it an edge-to-edge screen is correct as the screen borders with three of the phone's sides. The press images are a bit misleading in this respect - depicting the screen almost as an infinity pool. The screen looks even more special due to its rounded corners. This allows the screen to follow the shape of the phone's own rounded corners creating the stunning looks this phone is known for. Xiaomi announced the phone with a claim of a previously unheard 91.3% screen-to-body ratio, and while the math didn't quite work out, it certainly stirred our reader's community. We decided to measure the screen ourselves. We took a photo of the real-life Xiaomi Mi Mix head-on and we carefully selected the phone and the screen putting them on separate layers. We then used one of Photoshop's tools to measure the surface area of all pixels. All that remained was a simple calculation (screen-to-body ratio = phone surface area / screen surface area), which yielded 84.72%. We repeated the calculations using a simple ruler and a calculator the old-fashioned way, and we still ended up with a ratio that's not much higher than 84%. Since we published our article on the matter, Xiaomi has removed any ratio-related claims on their official specs page, so there is that, too. The screen didn't need any of those bold marketing claims to begin with - it's amazing as it is. Now that we cleared all the definitions, edges, bezels, and ratios, it's time to deal with the important numbers - contrast, colors, and sunlight legibility. There are three different contrast options in the display settings menu - Standard, Increased, and Auto contrast, with the latter being the default one. Xiaomi claims the screen will provide up to 500 nits of max brightness. Our test results confirmed and even exceeded the claim for maximum brightness as we measured 590nits worth of luminance at the Standard Contrast , and 551nits - at the default Auto setting. The screen's contrast ratio is excellent as well at 1309:1 in Standard or even better at 1:1489 in Auto Contrast mode, once again exceeding the promised contrast ratio of 1300:1. The minimum display brightness is 6.5 nits, which means the screen should be suitable for late-night reading in a dark room. The blacks are deep enough for a joyful experience, no matter which contrast mode you will settle for. When it comes to color rendering, the Xiaomi Mi Mix has a very good color accuracy with an average DeltaE of 5.3 and a maximum deviation of 10.7 in the blue color. Note that we did our color test in Standard screen mode. If you opt for the Auto mode, you will get a bit punchier colors, especially the blue one, at the expense of color calibration. Unfortunately, the screen of the Xiaomi Mi Mix performed only average in our sunlight legibility test. The Xiaomi Mi Mix is powered by a beefy 4,400mAh battery, which seems enough for a phablet of this size. It supports Qualcomm's Quick Charge 3.0 standard and there is a compatible fast-charging plug within the retail box. Our test shows the charger fills 35% of the battery in 30 minutes, a result more suitable for the Quick Charge 2.0 standard. 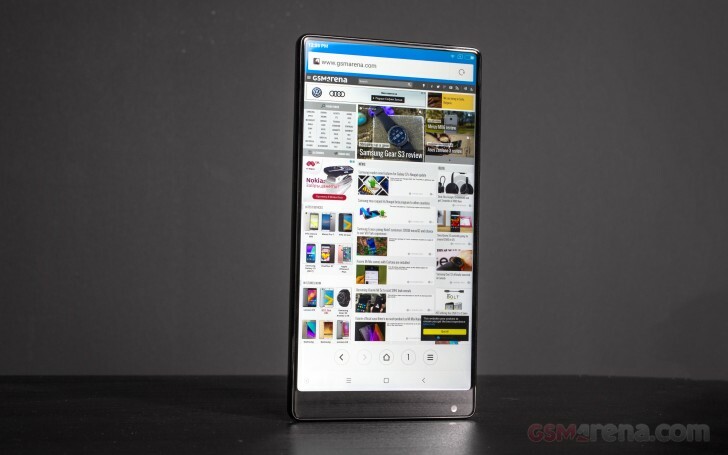 We ran our battery test, and the Xiaomi Mi Mix scored a 97h rating, which means you can count on the battery to last four days if you do an hour each of calling, web browsing and video playback a day. The phone outed consistently good scores across all battery tests, including standby. The Xiaomi Mi Mix supports 11 LTE bands, quad-band GSM and quad-band 3G connectivity with HSPA support. You can tap to an LTE network on either SIM, but once you do, the second one will be limited to 3G or GSM connectivity. You can even have both registered on 3G networks, when 4G is not available. There is no FM radio support. There is also no IR blaster on the Mix. Xiaomi Mi Mix comes with USB Type-C port. Media transfer mode is supported for accessing the phone's built-in memory over a USB connection. The port also supports USB On-the-go for connecting USB peripherals such as pen drives, keyboards or USB hard drives, but you'll need to buy a proper adapter for that.